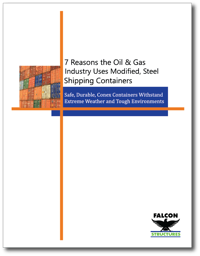 Thank you for your interest in our shipping container guide: “7 Reasons the Oil & Gas Industry Uses Modified, Steel Shipping Containers.” We've also sent you a confirmation email that includes a link to the download. In addition, if you have any other questions about shipping containers or Falcon in general, we’re happy to help! You can reach us at 877-704-0177 or drop us an email at sales@falconstructures.com.